Visiting Charleston’s famous 300 to 400 year old: ANGEL OAK TREE. Mr. Burbage’s first item of business in 1990 when the land came under Charleston’s wing was to analyze and discover the condition of the tree and propose a plan to preserve it from disease, stormy weather and vandals (whether well meaning or otherwise). As this author learned in his own life, innocently carving initials in a tree can do a tree great harm. The repair was made to the top of the limb. It was determined that the cable supports placed by the former owners needed to be reconfigured to hold and support the tree limbs at best advantage. A large nonthreatening crack in a tree limb so bothered people that a placebo patch was made to arrest public fears. The old wooden fence was replaced with a less obtrusive green-colored chain link fence and a series of motion detectors were placed that would not be activated by forest critters, but would protect the tree from human intruders who might do the tree harm. The Gnome's wife waited just a bit too long. The shape of the tree is mystical, a storybook appearance that seems as if it could tell us many stories. There is view of the trunk that looks as if the resident gnome’s wife (waiting too long for him to come to dinner from high in the branches) has become a part of the tree! (Author’s literary license). Angel Oak is covered with resurrection fern (polypodium polypodioides,) an air plant, which means it attaches itself to other plants and gets its nutrients from the air and from water and nutrients that collect on the outer surface of bark. Resurrection fern lives on the branches of large trees such as cypresses and live oaks. It is often found in the company of other air plants such as Spanish moss and wild pine. The resurrection fern gets its name because it can survive long periods of drought by curling up and appearing dead, until new rain causes it to restore itself. 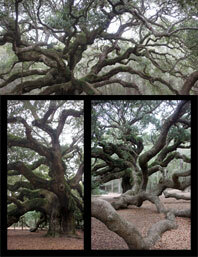 Angel Oak has grand limbs and a huge trunk that surely looks like the residence of gnomes. The name of the tree dates back to some past owners, a family named Angel. The tree was named the Millennium Tree in 2000 and, in 2004, dubbed the 2004 South Carolina Heritage Tree as a natural wonder. It is estimated the tree is about 300 to 400 years old. It stands at 65 feet in height and its area of shade is 17,000 square feet. Its trunk circumference is 25.5 feet, the circumference of its largest limb is 11.5 feet with its longest limb some 89 feet in length. No admission fee is charged and the gift shop is nicely stocked with many items about the tree and books on the history of the surrounding Charleston area. Such a wonder of nature survives in a delicate balance. Some concerns are that Angel Oak is currently facing the threat of development and the destruction of its surrounding forest. While the Angel Oak itself is not in danger of being cut down, many people believe its neighboring forest has protected the tree throughout its long life. The forest naturally provides shelter from storms, as well as adequate moisture and drainage. Additionally, it filters harmful pollutants before they reach the tree’s roots, bark, and leaves. But the surrounding forest is a remnant forest that has been forested at least 3 times. City stipulations for development mandate a 150 foot untouched buffer around the tree. Four leading U.S. urban forestry scientists (including a forest hydrologist) do not believe that the development, as planned, will harm the tree at all. Two of these scientists were hired by the developer as a result of the City’s stipulation. The county road leading to the park is in need of repair due to the extraordinary 2009/2010 winter weather. One is forced to drive through chuck holes and mud slush to get there on the unpaved county road, but the trip it is worth the challenge. The higher than average rainfall this winter has rendered the road thus. It usually is not bad. The City is committed to keep the road dirt to preserve the rural feel of the island. Visitors to the surrounding area wonder why some of the multi-million dollar home owners down the road on Kiawah Island don’t establish a city endowment for such a valuable wonder so near to their homes, to help maintain the road and preserve this Low Country treasure for future generations of South Carolinians and others of us fortunate enough to discover it. Another great post! I can read this blog all day! Pictures are awesome too. Looking forward to featuring them on The Wanderlust Way. What a Remarkable Journey! When does the book come out? Wow. What an amazing tree. So glad you are on this journey to open our eyes to such beauty right here in the US. Keep on truckin…..and bloggin’! Enjoyed your Angel Oak submission. We went over to the Spanish Shell Mount after seeing you. Worth the short hike from Live Oak Landing. If only that tree could talk, what stories it could tell! Hope SC continues to preserve it. Thank you for featuring our beloved Angel Oak. It is a local (and regional) treasure. Your words served it justly. I am now an avid devotee of your blog and will look forward to following your travels and the thoughts, images and stories they engender. I love the amount of ‘homework’, local lore, tradition and history you entwine in your posts. Makes me feel right there. Great portrait of a beautiful tree. Well named too …. Gives gnarly a whole new meaning. Great shots. Interesting background. I saw a history channel story that said Union troops first read the Emancipation Proclamation to the local slaves under a large spreading oak tree on one of the sea islands south of Charleston. Maybe somebody could research that and see if it was Angel Oak. Fact-check: Everything else I have read suggests this tree is 1500 years old … not 300-400. -the ages of other Live oaks of similar sizes growing under such favorable conditions.